While most people missed out on the self-released studio album that Coves put out three years ago, the psychedelic garage pop duo has been steadily gaining attention with EPs and singles. All of it, including a cover of Wicked Game by Chris Isaak, has earned them enough attention to reach some sort of critical mass. Made up of Rebekah "Beck" Wood and John Ridgard, the duo places their emphasis on creating the kind of scizz rock stomp that they liken to the kind of garage rock made by producersJoe Meek, Phil Spector, and Martin Hannett. It likely helps that A&R man James Endeacott is part of their management. Soft Friday is a trippy bit of weekend gloom and sunshine. Expect listeners to break in two directions this time out. Some people have taken to the notion that dirty synths and scuzzy guitars have become a go to direction for a band that can't carry a clean sound. 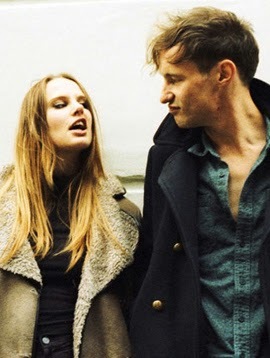 Others will hear something different, especially as Coves manages to turn their dirt into emotion. Wood is the songwriter and Ridgard is the producer. And while the band is knee deep in nostalgia, their work in the basement studio of Castle Greyskull has delivered ample noteworthy moments. The vintage-edged opener Fall Out Of Love perfect fully balances bleating and sadness. Without missing a beat, Coves dives into a distortedly atmospheric meandering of Honeybee, which slips into the darker recesses of pop and infatuation. The sound is sweetly minimalistic, but the lyrics are drearier as the band paces itself for some of the better tracks. Beatings works much harder to establish the band with the Western twang of its guitar and abundance of sound effects. Most notable is the organ accompaniment that fills every gap to smooth out its foundation along with some beautifully harmonic and dreamy vocals from Wood. After Beatings, Coves doubles down with the upbeat and dreamy Last Desire. The heavy baseline and drumbeat drives the song, while the spaced-out synth gives the entire piece its heady spookiness. It's all throwback, but throwback in the very best way. The same can be said about Let The Sun Go. It's almost a shame the band stumbles with too much experimentation. The whole of it is boring. Fortunately, the band brings the album back on track with the fuzzy directness of Cast A Shadow. The bouncy, simplistic sound perfectly sets up the two brooders and album closer, Wake Up. After ten tracks, it's pretty clear that there is a lot going on here. Wood is perfect at delivering heartfelt contemplative lyrics, especially when Ridgard sings underneath her. And even though not all of the songwriting is as developed as it could be, it's her voice along with some creative instrumental choices that adequately refresh the vintage feel the duo so desperately wanted to revive. Soft Friday By Coves Slips In At 6.7 On The Liquid Hip Richter Scale. All in all, it's a sold debut with a very clear direction. Soft Friday is extremely listenable any time you have a hankering for psychedelic pop with a vintage edge. Other than one or two tracks that don't reach their true potential, the album accomplishes what it sets out to do. You can't go wrong. Soft Friday by Coves is available from Amazon or you can download it for iTunes. Check Barnes & Noble for the vinyl release of Soft Friday by Coves. For touring information, visit Facebook. They sometimes tour with Band Of Skulls.